They also said my code FLEXCODE06 was not added and I needed to stop in the branch to add it. He asked me to bring in the flyer as well. Luckily I was able to email myself a cert here. I called the branch and they added the code since the guy remembered me for our interview. I am just going to let the second deposit drop and I will bring in the MyPay stub to show them that its an actual payment source. Do not rely on TD Ameritrade because it will not count. 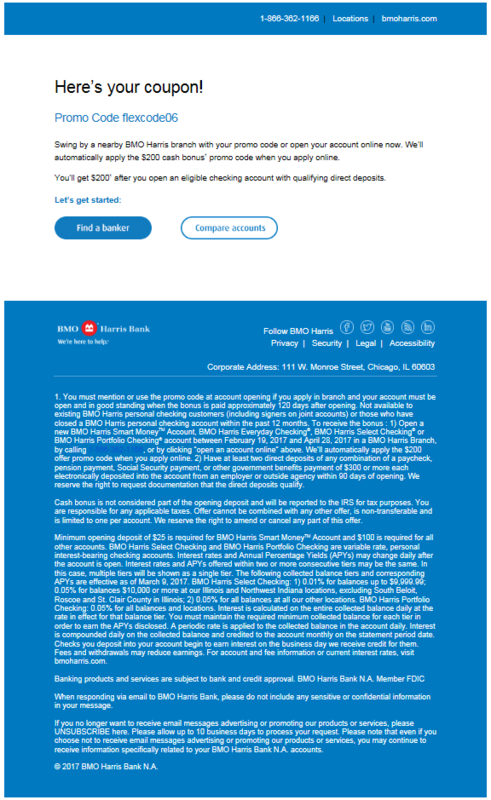 So there you go for a data-point, BMO seems to be going out of their way to protect themselves from bank churners. Making me work extra hard for my $200. Thanks to Danny’s deals for the offer link! Even after all of this I wont see the bonus for 120 days since opening, but at least I got all to documentation here in one place. Check with me 120 days from 13 March 2017 which is Tuesday, July 11, 2017. Unfortunately, I don’t have a BMO branch near me so I will be disappointed if the bonus doesn’t automatically apply.